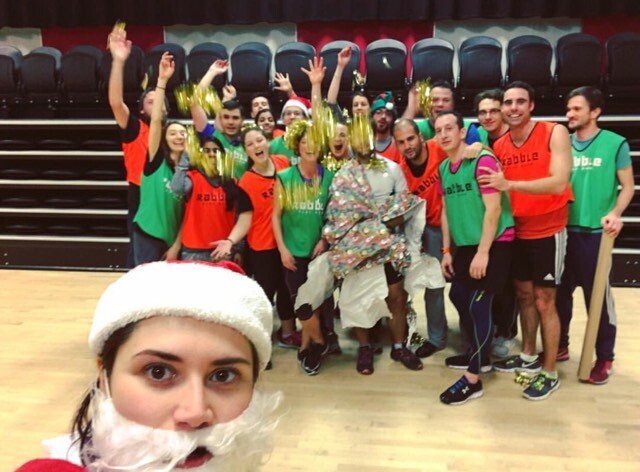 “In all seriousness, what makes a great Rabble session is something with an inclusive, fun, encouraging environment. So this is my first tip: as an instructor, your imperative is to ensure that the moment a player arrives at your session, they feel welcomed, they feel part of a community, and they feel at ease. It’s easy to take for granted how daunting it can be turning up to an exercise class on your own, not entirely knowing what to expect, and this is one of the many reasons I think Rabble stands out from other fitness – it’s immediately welcoming and inclusive. It’s important to gradually increase the intensity of the fitness session, so you must begin with a warm-up. 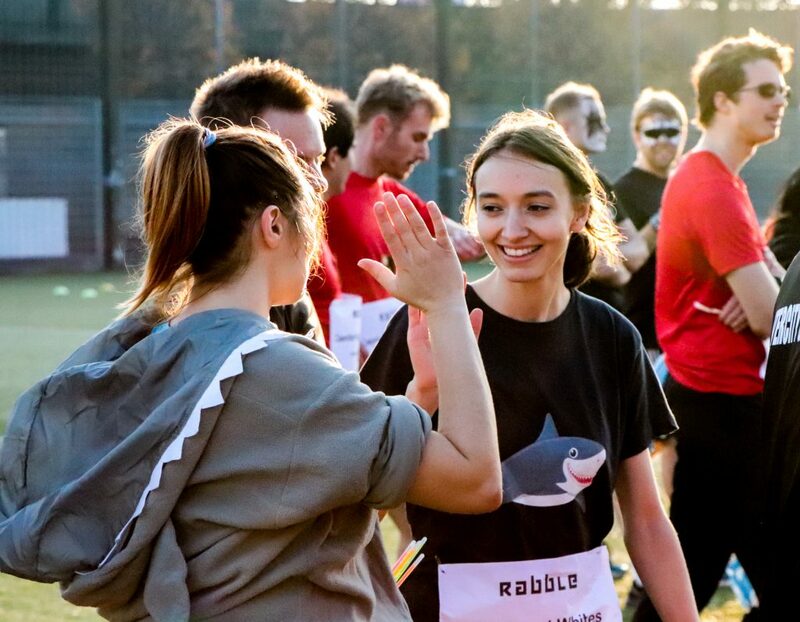 Rabble has a huge database of games to give your sessions loads of variety, but generally,a warm-up will be a simple game that has multiple rounds to allow for an increase in speed and intensity. Once I’ve run my warm-up, I’ll then run a ‘name game’ if we have new people along. This is a really unique aspect to Rabble; I’ve not seen this at any other fitness class or club I’ve attended. Newbies instantly get to learn a few names, and the regulars (because they have less names to remember!) will learn the newbies’ names and make them feel included in the games thereafter by offering personal encouragement. What I love about this is that it offers something for everyone. I’m naturally a ball-game player, having grown up playing netball, basketball and football as a kid, so netsketball or Frisbee endzone are my personal favourites. However, if you’re not a natural ‘baller’, then chances are you’ll enjoy a good ol’ game of Robin Hood or Capture the Flag. For the main game and the contrast, I’ll generally play around 3 variants, gradually adding more rules or building the intensity, which can often add whole other levels of strategy as well as skill on the field! It’s great watching the players tick over in their heads what their game plan is, and seeing the team-bonding happen instantly as they work out their best attack! The main watch-out though is to plan for those loopholes – if you don’t spot them and call them out, then someone on the pitch will, it’s inevitable! The session ends with what Rabble refers to as its HIF – High-intensity Finish. Its aim is to do exactly that – end the session with a blast or two of intense activity and game-play so any remaining energy your Rabblers have is focused and channelled into their final chance to win! This could be a running-based finish through a game like Jailbreak or Team Chase, or it could be more strength-based. If you’re running an indoor session then space is at a premium, so I’ve learnt to get pretty creative with my gameplay, particularly with the HIFs! This week, my players did a team relay Mexican wave… holding V-sits. 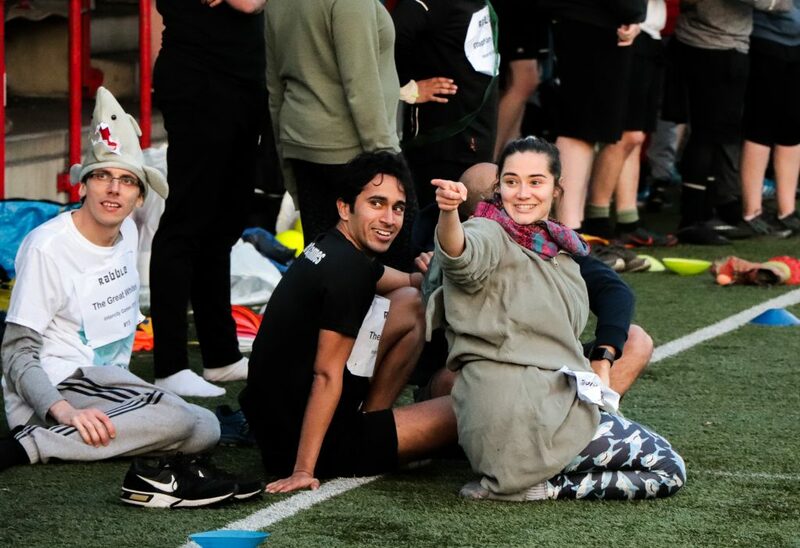 So as each player got to the front of their relay-line, they had to crunch in a Mexican wave ‘til the end of the line, then the last player gets up and runs to the front (and repeat). They worked SO hard, were all feeling it, but it was hilarious hearing them all shout “CRUUUUNCH!” as their v-sits Mexican-waved down the line! The HIF shouldn’t be the final part of your session. Once you’ve led a cool-down, updated your group on any upcoming socials (Did I hear someone say SKI TRIP?!) and made a fuss of anyone that was new, the key to growing a community, a group of friends that come back week-after-week, is the post-session social. This could be a trip to the pub, a picnic, a board game session… whatever it is, you should lead by example. Set the tone, lead your gang to the pub, and have a chat. Not only do you give any newbies the chance to make some new friends, but it can provide invaluable feedback for you, too. It’s amazing how quickly the payoff comes – these guys become your mates! I was lucky when I became an instructor, because I already had a good group of Rabble friends that were happy to let me lead them through a session and then join me at the pub after. Essentially, my Rabble session is also my weekly catch-up with my closest friends. But as my sessions grew and more newbies have joined, I’ve been so fortunate to keep extending my social circle and I have such a wicked group of friends that it’s just a pleasure turning up to instruct them each week. My rabble sessions, and the inevitable trip to the pub afterward, is one of the absolute highlights of my working week, without fail. I’m often asked how I go about planning sessions. A bit like Coach Klein from The Waterboy, I have a bright pink ‘playbook’. I write all my sessions out. When I first started instructing, I wrote out all the details, often sketched the layout of pitches, flagged any loopholes to myself, too. But now, with more experience and practice, my notes are generally pretty short, just writing out each game and the variants contained within each. I never go to a Rabble session without one – I recommend a playbook for all instructors, not just new ones! Oh, go on then. One of my key planning tips is matching up similarly-skilled players, and then making sure they go on opposite teams. It’s the easiest way to ensure a balance, but obviously only really helpful when you know who you’ve got coming! If I discover that the teams aren’t balanced, which sometimes happens, then I’ll call a half-time substitution and do some swaps. The trick with this is to make sure you always pick on different people, and I’ll generally always make two substitutions, not just one swap, so that it feels a bit less personal! Thinking about becoming an instructor? 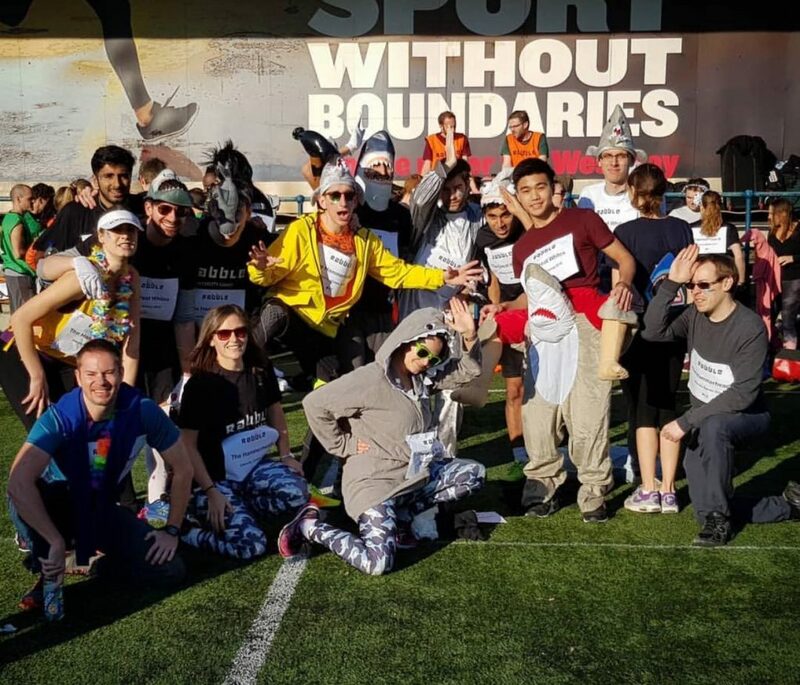 If you’re someone that doesn’t take life too seriously but knows how to lead and wants people to have a fun workout, then you’re probably what Rabble is looking for. In my opinion, the best instructors are ones that play, too! So I really recommend getting along to sessions as a player, seeing how other instructors lead their sessions and get a feel for how the games actually pan out as a participant. Don’t underestimate the sheer joy of running around chasing fellow grown-ups around a muddy field on a Tuesday night after a hard day’s graft! Hope to see you at a session soon, and feel free to ask me more of my Rabble tips and tricks…! Sounds great fun, but a bit daunting for someone just over 60 – even though I think it sounds perfect in terms of the general approach.. It would be so great if there was an over 50’s Rabble everywhere – please, please make it happen!! I would love to see over 50’s Rabble as a widespread thing. To have fun and variety while getting fit.